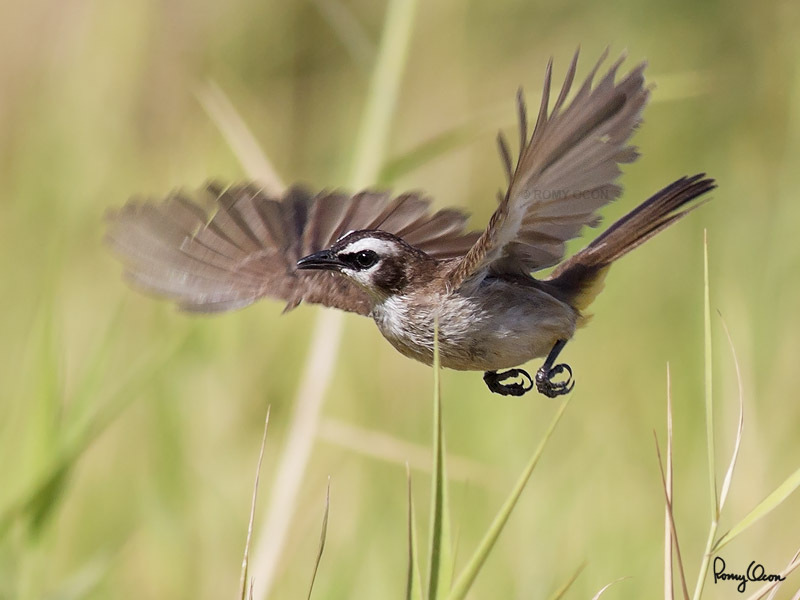 Next to the Eurasian Tree Sparrow, the Yellow-vented Bulbul is the most common bird in the Philippines. It is found almost everywhere, even in highly urbanized areas. Its varied diet of fruits, insects and small invertebrates helps it to thrive well in most places. At 7.5 inches total length, it is a medium small bird. I have been trying for quite a long time to get this bird in flight with a non-sky background, but its unpredictable and erratic flight pattern make this a very tough task. Lady Luck smiled at me a few days ago when I finally caught it in low flight, courtesy of the fastest handheld BIF combo on the planet – the 1D MIV + 400 5.6 L.
Habitat: Common in gardens, urban areas and grasslands but not in mature forests. Shooting Info - Paranaque City, Philippines, May 2, 2011, Canon 1D MIV + EF 400 5.6L, 1/1600 sec, f/7.1, ISO 400, manual exposure in available light, hand held. Some video footage of this common bird. Smallest RORO craft in the world?